Salari Sedigh, H., Rajabioun, M., Razmyar, J., Kazemi Mehrjerdi, H. (2015). An unusual necrotic myositis by Clostridium perfringens in a German Shepherd dog: A clinical report, bacteriological and molecular identification. Veterinary Research Forum, 6(4), 349-353. Hamideh Salari Sedigh; Masoud Rajabioun; Jamshid Razmyar; Hossein Kazemi Mehrjerdi. 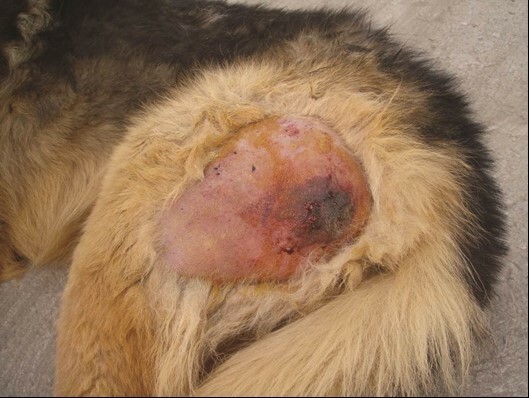 "An unusual necrotic myositis by Clostridium perfringens in a German Shepherd dog: A clinical report, bacteriological and molecular identification". Veterinary Research Forum, 6, 4, 2015, 349-353. Salari Sedigh, H., Rajabioun, M., Razmyar, J., Kazemi Mehrjerdi, H. (2015). 'An unusual necrotic myositis by Clostridium perfringens in a German Shepherd dog: A clinical report, bacteriological and molecular identification', Veterinary Research Forum, 6(4), pp. 349-353. Salari Sedigh, H., Rajabioun, M., Razmyar, J., Kazemi Mehrjerdi, H. An unusual necrotic myositis by Clostridium perfringens in a German Shepherd dog: A clinical report, bacteriological and molecular identification. 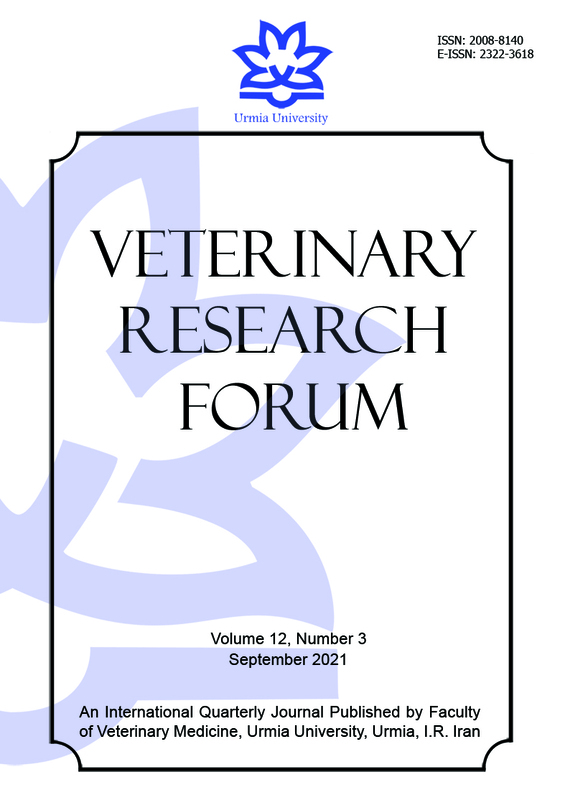 Veterinary Research Forum, 2015; 6(4): 349-353. Clostridial myositis, considered to be rare in pet animals, is an acutely fatal toxaemic condition. Some species of clostridia are responsible for necrotic myositis. A 2-year-old male German shepherd dog was admitted with non-weight bearing lameness and massive swelling of the left hind limb. Clostridium perfringens type A with alpha toxin was diagnosed as a pathogenic agent. Based on the history, the bacteria were introduced inside the tissue via contaminated needle following intramuscular injection. Urgent medical therapy followed by surgical intervention was performed. The dog was discharged completely healthy after hospitalization for four weeks. 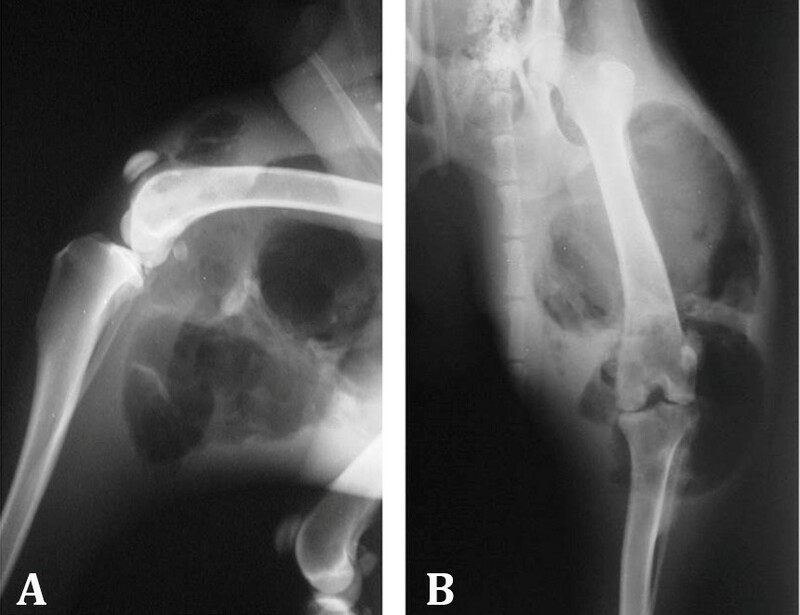 The objective of this report was to describe necrotic myositis in a dog with an emphasis on clinical signs and treatment as well as bacteriological and molecular identification of the micro-organism. Because of the fatal entity of the disease, prompt diagnosis as well as proper and urgent treatment is very important for successful therapy. This report described a treated case of necrotic myositis by C. perfringens in a dog caused by contaminated needle used for administering drug as well as bacteriological and molecular identification of the pathologic agent. A 2-year old male German Shepherd dog was admitted into the Veterinary Teaching Hospital, School of Veterinary Medicine, Ferdowsi University of Mashhad for non-weight bearing lameness and massive swelling of the left hind limb in the thigh region. According to the history taken from the owner, the swelling had begun from the previous two days when the dog was given an intramuscular anesthetic injection for restraint during purchase. Initial examination revealed fever (41.9 ˚C), tachypnea (respiratory rate = 60 bpm), normal heart rate (96 bpm) and diffuse non-pitting edema of the left pelvic limb around the left thigh. The left limb was massively swollen and tense, displaying severe cracking and soreness upon palpation, which indicated the presence of gas and edema. After shaving the affected area, a dark-red-rounded discoloured skin was seen on the caudal aspect of the left thigh that was well demarcated from the surrounding healthy skin (Fig. 1). Furthermore, the animal showed weakness, dyspnea and fever (41.2 ˚C). Manipulation of the limb was extremely painful, but no other injuries were apparent. Blood sample was taken and submitted for a complete blood count, creatine phosphokinase and liver enzymes level. Samples of tissue secretions were taken by sterile syringe for bacterial culture and antibiogram test. Fig. 1. Lateral view of the left hind limb after removal of hair on initial examination. Note the soft tissue swelling and discoloration of the skin into dark-red color at the caudal aspect of the thigh (The site of the intramuscular injection). Microbiological examination. Bacterial culture was carried out and incubated overnight in anaerobic conditions at 37 ˚C on blood agar media containing 5.0% sheep blood. Further passages from single colonies were sub-cultured on blood agar plates (Merck, Darmstadt, Germany) incubated overnight in anaerobic conditions using gas pack A jar (Merck, Darmstadt, Germany) at 37 ˚C. Bacterial culture revealed pure culture of C. perfringens and molecular typing of the isolates Type A (cpb2+) and positive for cpa toxin gene. Based on antibiogram test, the isolate was resistant to cefazolin, florfenicol and ceftriaxone but susceptible to penicillin, sulfadimidine, sulfadiazine and neomycin. Minimum inhibitory concentrations were determined by microdilusion method based on Clinical and Laboratory Standards Institute (CLSI) protocols on the Brucella broth (Hi-media, Mumbai, India) plates containing doubling dilutions of the antibiotics, from 0.25 to 0.256 mg L-1, and supplemented with 5.0% sheep blood. Prior to anti-microbial susceptibility testing, isolates were sub-cultured on a tioglicolate broth (Himedia, Mumbai, India). After incubation in anaerobic atmosphere for 18 hours at 37 ˚C, the cultures were suspended in a 0.85% NaCl to an optical density equivalent to that of a 0.5 McFarland standard. The isolate was inoculated on 96 wells plate. Reactions were tested twice and every test plates included positive and negative controls. Treatment and outcome. The therapy was performed initially based on aggressive fluid therapy, subcutaneous enrofloxacin (10 mg kg-1; Razak Laboratories Co., Tehran, Iran) and intravenous metronidazole (15 mg kg-1; Samen Pharmaceutical Co., Mashhad, Iran). After the emergency treatment the patient was referred to radiology ward and lateral and craniocaudal radiographs of the affected limb were taken. The radiographs revealed severe soft tissue swelling with presence of massive gas in soft tissues around the left thigh and stifle joint indicative of emphysema with-out any sign of bone and joint involvement. Gas trapping was also seen in caudal aspect of the left femur and stifle joint (Fig. 2). Hematology revealed severe leukocytosis (31300 cells per µL) and neutrophilia (adult: 25040 cells per µL, band: 2817 cells per µL) resulting from sepsis and biochemistry panel showed elevation of liver enzymes (alanine aminotransferase: 137 U L-1, aspartate amino-transferase: 349 U L-1, alkaline phosphatase: 420 U L-1) and also creatine phosphokinase (6007 IU L-1) indicating muscle injury. The dog was hospitalized and treatment was continued by the penicillin (50000 IU kg-1) based on the result of fine-needle aspiration cytology that indicatedthe presence of spores. Two days after initial presentation, the animal remained non-weight bearing and discoloration area was enlarged indicating the progress of the lesion. Fig. 2. Lateral (A) and cranio-caudal (B) radiographs of the left hind limb. Note the severe soft tissue swelling and severe gas accumulation in soft tissue around the femur and stifle joint. The dog was referred to surgery ward and after premedication with intramuscular acepromazine (0.03 mg kg-1; Alfasan, Woerden, The Netherlands), anesthesia was induced with combination of intravenous diazepam (0.2 mg kg-1; Caspian Tamin Pharmaceutical Co., Rasht, Iran) and ketamine (6 mg kg-1; Alfasan, Woerden, The Netherlands). Following intubation, anesthesia was maintained using 1.5 to 2% isoflurane (Nicholas Piramal Ltd., Mumbai, India) delivered in 100% oxygen. A lengthwise incision was made in the relevant area of the affected hindlimb to allow debridement and resection of the necrotic tissue extending through the muscles and pus. A large quantity of pink, foul-smelling, purulent fluid was removed. The tissues were lavaged with 500 mL of 5% oxygenated water for five days after operation, and then before wound closure, a penrose drain was inserted subcutaneously. Postoperative pain was controlled by injectable meloxicam (0.3 mg kg-1, Razak Laboratories Co., Tehran, Iran) intramuscularly for three days. Postoperative follow-up revealed satisfactory improve-ment, food and water were taken on the day after surgery, urine and faeces were passed and the temperature fell to normal range within 48 hr. Based on culture and antibiogram test, 4.5 g piperacillin/tazobactam (Daana Pharma Co., Tehran, Iran) were injected intravenously as continuous rate infusion in Nacl 0.9% dextrose 5.0% solution every 12 hr for three days. After that ampicillin (25 mg kg-1, Jaber-Ebne-Hayyan Pharmaceutical Co., Tehran, Iran) was given orally every 8 hr for four weeks and then 5.0% sodium hypochlorite dip used every other day to reduce anaerobic clostridia count. The dog was hospitalized for four weeks and discharged completely healthy. Clostridial myositis is often recognized as an acute, rapidly progressive, invasive edema, massive death of tissue and a variable degree of gas production, reported in cattle,2-7 horses,9-13 sheep and goats,14 pigs,15 black bear,16 rhesus macaque,17 and dog.18-23 Cases have been reported in the literature in association with orthopaedic injuries, intra-muscular injections or with no apparent injury.18-22,23-26 The initial source of the infection was not identified in some reported cases.18,21-23 In this report, infection was trans-mitted most likely through the infected injection needle. Typically, clostridial infections are characterized by muscle necrosis with gas and toxin production, and associated with foul smelling exudates. The affected limb is swollen and painful. The patient is usually pyrexic with varying signs of toxaemia including congested mucous membranes, weak pulse rate, and elevated heart and respiratory rates. In human literature, necrotizing soft-tissue infections can be classified according to depth of tissue involvement, severity of infection, or microbiology. Each system has its advantages. The Food and Drug Administration classifies infections of skin and soft tissues as either complicated or uncomplicated. An uncomplicated infection responds to a simple course of antibiotics or incision and drainage. Complicated infections involve deeper tissues and generally require surgical intervetions.33-34 Because of life-threatening nature of this infectious, rapid diagnosis and treatment must be considered by clinician for saving the dog. The authors thank Mr. Ali Kargar for technical assistance in Laboratory of Faculty of Veterinary Medicine, Ferdowsi University of Mashhad, Mashhad, Iran. Lucey BP, Hutchins GM. William H. Welch, MD, and the discovery of Bacillus welchii. Arch Pathol Lab Med 2004;128(10):1193-1195. De Assis R, Lobato FCF, Nascimento RAP, et al. Bovine clostridial myonecrosis. [Portuguese]. Arq Inst Biol 2010; 77(2): 331-334. Caplan ES, Kluge RM. Gas gangrene: Review of 34 cases. Arch Intern Med 1976; 136(7):788-791. Songer JG. Clostridial enteric diseases of domestic animals. Clin Microbiol Rev 1996; 9(2):216-234. Thomson M, Eger C. Management of a femoral fracture complicated by clostridial myositis. J Small Anim Pract 1997; 38(2):70-73. Poursoltani M, Razmyar J, Mohsenzadeh M, et al. Isolation and antibiotic susceptibility testing of Clostridium Perfringens isolated from packaged wing, neck, liver and gizzard of broilers in retail stores of northestern of Iran. Iran J Med Microbiol 2013; 7(1): 35-39. Harwood D. Apparent iatrogenic clostridial myositis in cattle. Vet Rec 1984; 115(16):412. Brown C, Kaneene J, Walker R. Intramuscular injection techniques and the development of clostridial myositis or cellulitis in horses. J Am Vet Med Assoc 1988; 193(6):668-670. Chio YK, Kang MS, Yoo HS, et al. Clostridium perfringens type A myonecrosis in a horse in Korea. J Vet Med Sci 2003; 65(11):1245-1247. Farias L, Azevedo MDS, Trost ME, et al. Acute myonecrosis in horse caused by Clostridium novyi type A. Braz J Microbiol 2014; 45(1):221-224. Peek S, Semrad S. Clostridial myonecrosis in horses. Equine Vet Educ 2002; 14(3):163-168. Peek S, Semrad S, Perkins G. Clostridial myonecrosis in horses (37 cases 1985-2000). Equine Vet J 2003; 35(1):86-92. Raymundo DL, Pavarini SP, Bezerra Junior PS, et al. Acute Myonecrosis Clostridium septicum in horses [Portuguese]. Pesq Vet Bras 2010, 30(8): 637-640. Lima C, Salvarini FM, de Gomes AM, et al. Outbreak of gas gangrene in flock of sheep and goats [Portuguese]. Ciênc vet tróp2006; 9(2/3):106-109. Pinto FF, Assis RAD, Lobato FCF, et al. Malignant edema in swine [Portuguese]. Ciênc Rural 2005; 35(1):227-229. Barnes D, Rogers L. Clostridial myonecrosis in a black bear associated with drug administration. J Wildl Dis 1980; 16(3):315-317. Meier TR, Myers DD, Eaton KA, et al. Gangrenous Clostridium perfringens infection and subsequent wound management in a rhesus macaque (Macaca mulatta). J Am Assoc Lab Anim 2007; 46(4): 68-73. Denny H, Minter H, Osborne A. Gas gangrene in the dog. J Small Anim Prac1974; 15(8):523-528. Mane M, Vives MA, Barrera R, et al. A putative clostridial myositis in a dog. J Small Anim Pract 1992; 33(7):345-348. Pichler ME. Gaseous gangrene in a dog: Successful treatment using hyperbaric oxygen and conventional therapy. J Am Anim Hosp Assoc 1982; 18(5): 807-811. Poonacha K, Donahue J, Nightengale J. Clostridial myositis in a dog. J Am Vet Med Assoc 1989; 194(1):69-70. Ribeiro MG, Silva ROS, Pires PS, et al. Myonecrosis by Clostridium septicum in a dog, diagnosed by a new multiplex-PCR. Anaerobe 2012; 18(5):504-507.
Cooper N, Unsworth IP, Turner DM, et al. Hyperbaric oxygen used in the treatment of gas gangrene in a dog. J Small Anim Pract 1976; 17(11):759-764. Miller RA, McCain CS, Dixon D. Canine clostridial myositis. Vet Med Small Anim Clin 1983; 78(7):1065-1066. Stead A, Lawson G. A study of the incidence and significance of Clostridium welchii in the wounds of dogs undergoing open reduction of fractures. J Small Anim Pract 1981; 22(1):1-6. Whittington R, Freeman P. Myositis due to Clostridium chauvoei in an Afghan Hound. Aust Vet Pract 1986; 16(1):7-8. Meer R, Songer JG. Multiplex polymerase chain reaction assay for genotyping Clostridium perfringens. Am J Vet Res 1997; 58(7):702-705. Greene CE. Infectious diseases of the dog and cat. In: Greene CE, Jang SS (Eds). Anaerobic Infections. 3rd ed. St. Louis, USA: Saunders Elsevier 2012; 411-416. Hatheway CL. Toxigenic clostridia. Clin Microbiol Rev 1990; 3(1):66-98. Dontchos BN, Ricca R, Meehan JJ, et al. Spontaneous Clostridium perfringens myonecrosis: Case report, radiologic findings and literature review. Radiol Case Rep 2013; 8(3): doi: 10.2484/rcr.v8i3.806. Calabrese EJ, Dhawan D. The role of x-rays in the treatment of gas gangrene: a historical assessment. Dose Response 2012; 10(4):626-643. Stevens DL, Bisno AL, Chambers HF, et al. Practice guidelines for the diagnosis and management of skin and soft tissue infections: 2014 update by the infectious diseases society of America. Clin Infect Dis 2014; 59(2):e10-e52. Stevens DL, Bisno AL, Chambers HF, et al. Practice guidelines for the diagnosis and management of skin and soft-tissue infections. Clin Infect Dis 2005; 41(10):1373-1406. Ustin JS, Malangoni MA. Necrotizing soft-tissue infections. Crit Care Med 2011; 39(9):2156-2162.